The central part of the constellation Orion is shown here. 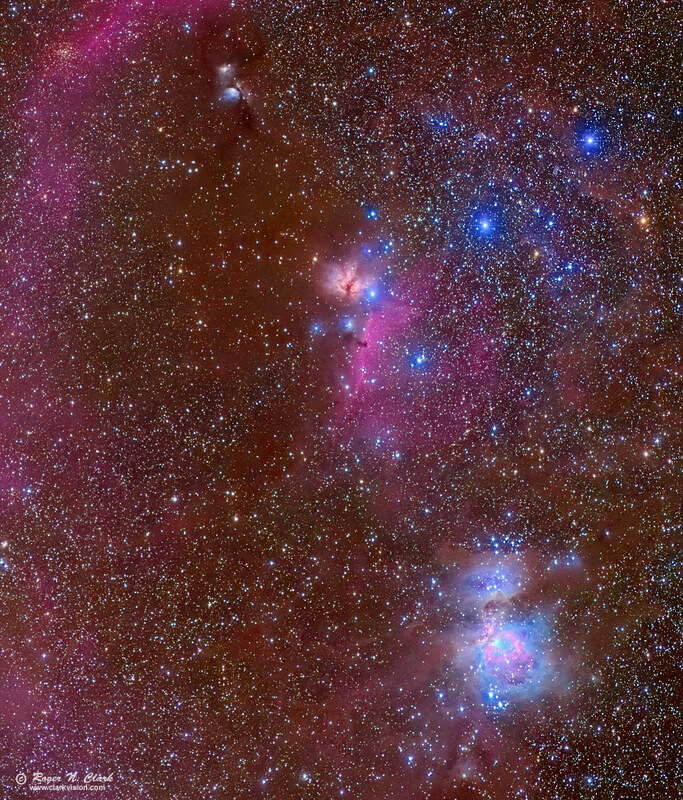 In the upper right of the image are the 3 bright blue stars making up the belt of Orion, the Hunter, and below the belt are 3 stars making the sword of Orion. In the sword is the Great Nebula in Orion, M42, and M43, which is visible to the unaided eye as a fuzzy patch, and intricate detail and colors can be seen in modest sized amateur telescopes. Below the left star of Orion's belt is the Horsehead nebula, which is visible in amateur telescopes from dark sites. At upper left of center is the small nebula M78. The large pink arc on the left side of the image is Barnard's loop. In the upper left corner is the open star cluster NGC 2112, which is about 1.8 billion years old. The reds and pinks are emissions from hydrogen. Blues are reflection nebulae. Orange is interstellar dust. This image was made with a stock digital camera and processed to bring out the wonderful colors in the region. Stars to about magnitude 17 were recorded. Technical. This image is from one position of a 7-frame mosaic, obtained with a Canon EOS 6D Mark II DSLR Camera and Sigma 105mm f/1.4 DG HSM Art Lens at f/1.4 and ISO 1600, 30 second exposures and many exposure stacked at each mosaic position. No dark frame subtraction, no flat fields. Tracking with a Fornax Lightrack II and no guiding. This section of the mosaic is composed of 61 frames, 30 seconds each (30.5 minutes total). Short exposures were made for the bright M42 region: 7 frames at 8 seconds, 8 frames at 3 seconds and 6 frames at 1 second were stacked. The total exposure for this image was 31.9 minutes. The full resolution image plate scale is 11.2 arc-seconds per pixel and the scale here is 1/2 that, 22.4 arc-seconds per pixel, or slightly higher resolution than normal human eyesight for bright scenes. Post processing: Raw conversion with Rawtherapee with settings tuned for astrophotos, including maintaining star color in saturated stars. Rawtherapee processing settings described here. Output color space was Rec.2020 to match the future of high dynamic range TVs and the web presentation here is sRGB. Look for a future article on this topic. Stretched with rnc-color-stretch. Also see Astrophotography Image Processing Basic Work Flow. This is a natural color image. The high dynamic range of astrophotos must be stretched to bring out the range of details the camera recorded. But the typical image stretch process loses color for brighter subjects (e.g. stars and the brighter parts of deep sky objects become whiter as they are made brighter). This image uses a new algorithm that does not lose color during the stretch. The new algorithm enables fainter details to be shown and with less noise. Learn about the new software and download it free (open source) here: rnc-color-stretch. Accurate color at the low end depends on accurately subtracting airglow and light pollution. On this night, the airglow was very high. CEFA = 676,000 minutes-cm2-arc-seconds2 (11.2 arc-seconds / pixel).